Main House + Loft: 2 Bedrooms with 2.5 Bathrooms. Attached Studio available. This luxury furnished home with panoramic views of the Atlantic Ocean is located on a pristine pink sandy beach. The secluded beach is ideal for swimming, snorkeling, lobstering, spear fishing, strolling, and beachcombing . Generator with automatic transfer switch recently added and cistern is used. You don't have to worry about water and electricity being off. Jolly Mon's main floor has a British Colonial decor with a master bedroom, 1.5 bathrooms, kitchen, with top of the line appliances, great room, and veranda. The great room features a flat panel TV and stereo system with iPod docking for music to be enjoyed throughout the home and veranda. Wireless internet, and satellite TV are provided, air conditioning is available, although the ocean breeze flows through the home because of the elevation and not only keeps it cool but allows you to enjoy the sounds of the ocean. The loft area has a separate bedroom with a king size bed, a sitting area and office area and a full spa bathroom, with dual sinks, shower and a spa tub that has elevated, breathtaking views of the Atlantic Ocean. There is a nautical decorated studio on the lower floor with a private entrance, queen bed, futon, kitchen area, and bathroom with shower. The studio may be rented with the main house. Panoramic views of the Atlantic from every room and the expansive veranda. Jolly Mon is located on a 2.5 acre estate lot on North Shore Dr. (Old Banks Road) in North Palmetto Point. This magical place is only 10 minutes south of Governor's Harbour and 25 minutes south of GHB airport and 45 minutes north of RKS airport. You are centrally located on this 110 mile long island which makes exploring very convenient. You will enjoy some of the best beaches in the Caribbean and be able to take your pick between watching a sunrise or a sunset! There are many wonderful restaurants on the island and are provided in our guest book. If you like to cook in a gourmet kitchen, you can buy fresh fish every day at the harbour dock. Come check out Jolly Mon, a truly magical custom built home. You will appreciate the versatility of the design, the quality of the construction, and the beautiful endless views of the Atlantic Ocean. This is truly a special vacation destination that you will want to return to year after year. toilet, tub, shower, Loft tub has elevated ocean views. Unbelievable!! Outstanding views from every room and the spacious veranda. 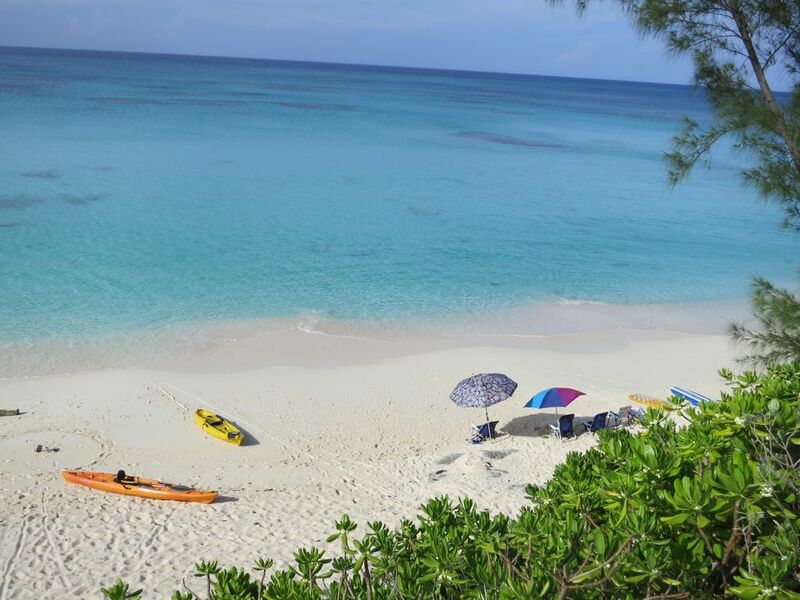 The stunning natural beauty of Eleuthera is enough to enamor and please under any circumstance. It’s a landscape that would ordinarily stand unparalleled to any lodging accommodation. Jolly Mon; however, rises to the challenge, and even raises the bar. The awe hits as soon as you walk in the door and see the outstanding and expansive views of the crystal blue ocean. The views are consuming at first, so it’s not until a little later that you realize the exquisite interior. This home has been designed to honor and exemplify the breath taking natural environment on which it sits. Every detail has been thoroughly considered and appointed in Jolly Mon. It’s beautiful, yet comfortable. Opportunities abound to enjoy gorgeous views, and a very secluded private beach that feels like your own personal island paradise. Ocean toys, including snorkel gear, kayaks, and stand up paddleboards, are available for those for want to be active. Otherwise, it’s a perfect environment to just kick back, relax, and take in the inspiring scenery. Jolly Mon is a home that truly pays tribute to its remarkable environment, while encompassing the welcoming and warm spirit that is the hallmark of Eleuthera. Well appointed with everything you need for a relaxing get away. Fantastic inside and out. Truly a wonderful family vacation home. What an amazing place. Suited the five of us perfectly. My son and his wife in the apartment and my daughter in the loft. Just a wonderful home with easy access to the beach which we had entirely to ourselves the whole week. Centrally located on the island for exploring the many beautiful beaches and towns of Eleuthra. We will certainly return and stay here again. Owners are wonderful and made sure our stay was perfect. House is spacious and comfortable for 2 couples. Beach right out front is gorgeous. We cooked almost every meal at home and were always happy to return after a day of exploring. Can’t wait to come back! This is my 3rd time staying at Jolly Mon. The home is impeccable, with amazing views from every window. Jane has thought if everything. The beach is gorgeous and private. Perfect for a relaxing vacation. Sandi, the house manager, is wonderful! Love her to pieces! Built directly on the Atlantic beach, about a quarter of a mile south of Unique Village on North Shore Drive (Locally known as Old Banks Road) in N. Palmetto Point. CONTACT OWNER IF YOU REQUIRE A MORE FLEXIBLE SCHEDULE [+/- 7 DAYS]. We also have an attached STUDIO with a queen bed, futon, full kitchen & full bath. This lower level studio has a private entrance, satellite TV and ocean views. The STUDIO is only rented with the Main House and is an additional $525 per week. Please call 714-392-1156 or e-mail janesnnyd@yahoo.com for more information and rates.